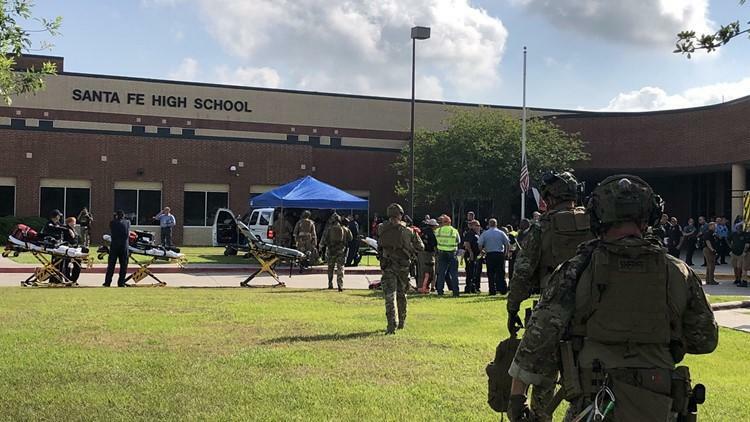 SANTA FE, Texas -- The suspect in a Friday's deadly Texas high school shooting has been identified as 17-year-old Dimitrios Pagourtzis. Texas Gov. Greg Abbott said 10 people were killed and 10 others wounded in the shooting Friday morning at Santa Fe High School south of Houston. The suspected shooter, who was in custody, also had explosive devices, including a molotov cocktail, that were found in the school and nearby, said Gov. Greg Abbott, who called the assault "one of the most heinous attacks that we've ever seen in the history of Texas schools." Police found pressure cookers and pipe bombs around the school, one law enforcement source told CBS News. Pagourtzis has been booked into the Galveston County jail and is being held with no bond on charges of capital murder and aggravated assault of a peace officer. Additional charges may follow, according to the Galveston County Sheriff's Office. Among the dead were a substitute teacher and several students, law enforcement sources told CBS News senior investigative producer Pat Milton. Students described Pagourtzis as quiet and "weird" because a long trench coat was part of his wardrobe, even on days when the temperature neared 90 degrees, CBS News' Omar Villafranca reports. His motive is still unclear. A federal law enforcement source said there was still an active search for explosives, CBS News justice and homeland security correspondent Jeff Pegues reports. Several law enforcement agencies are searching a mobile home less than three miles away from the school where records show the teen lived, CBS affiliate KHOU reports. Investigators were in the process of serving search warrants at two residences and the suspect's car, but they were using extreme caution because of the potential for more explosive devices to be uncovered, said Abbott. Abbott said the suspect had information in journals, on his computer and on cell phones that indicated he wanted to commit the shooting and take his own life afterward. Abbott said the suspect "gave himself up" and told authorities that he did not have the courage to take his own life. Pagourtzis posted the phrase "Dangerous Days" on social media before the rampage along with a pentagram symbol. Two weapons were used in the attack, Abbott said -- a shotgun and a .38 revolver, both of which were legally owned by the suspect's father. Abbott said he didn't know whether the father was aware the suspect had taken the guns. Abbott said federal and state prosecutors would jointly handled the case. Two other people were being questioned, he said, one person who was acting suspiciously at the scene and another who he said may have information and needed to be "fully interviewed." A school resource officer was shot and injured in the shooting, CBS News has learned. Another law enforcement officer was also reported injured but was not shot. Harris County Sheriff Ed Gonzalez said a male suspect, who he didn't identify, was in custody and a person of interest was detained and questioned. Both were believed to be students at the school. Pagourtzis played on the junior varsity football team and was a member of a dance squad with a local Greek Orthodox church. His social media pages showed multiple images of guns. He recently posted a photo wearing a t-shirt reading "Born to Kill" and there were also photos of a long green jacket with Nazi regalia. Student Damon Rabon told CBSN he was one classroom away from where the shooting happened in the art hall during first period. Rabon said the substitute teacher went out and looked and saw the shooter, who he described as a short male wearing a black trench coat carrying a backpack and armed with a sawed-off shotgun. Rabon didn't name the shooter but said he believed him to be a former student, either a sophomore or a junior. He described him as a quiet and "weird" type of guy who stood out because he wore a trench coat every day. Valerie Martin, who teaches at the junior high school in Santa Fe, told the New York Times she had Pagourtzis in her pre-A.P. language arts class last year and saw no warning signs. She described him as bright and said he had participated in the school's competition for a national history contest. "He was quiet, but he wasn't quiet in a creepy way," Martin told the paper. She said she has her students write in journals, and never noticed him writing or drawing anything disturbing. CBSN security analyst Paul Viollis said one major question investigators will look into is why Pagourtzis allegedly opened fire in the art room and whether the class was specifically targeted. Viollis said investigators will also likely seek to determine what websites Pagourtzis visited in the days leading up to the shooting. Neighbors of the suspect told KHOU that Pagourtzis lived at the mobile home with his family, who usually kept to themselves. Speaking at a press conference Friday, Sen. Ted Cruz said more would be learned about the suspect in coming days and "what red flags, what warning signs there may have been or may not have been." "I'm sure we'll have a robust conversation about what more could have been done to prevent this horrible tragedy," Cruz said. Abbott said any warning signs that did exist were "non-existent or very imperceptible" and said the suspect had no criminal history.